Nestled at the foot of an ancient hill fort in the lush green county of Somerset are three luxurious yurts and a stunning wooden roundhouse. Watch the sun set from your private deck, enjoy the woodland sauna, toast marshmallows on the fire pit, and immerse yourself in the incredible feeling of peace and tranquillity. 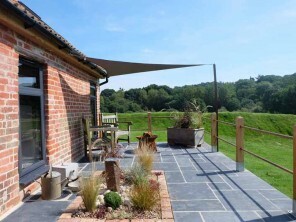 Part of an organic working dairy farm, the Yurt Retreat is a place where you can really connect with the stunning landscape. Each yurt is south facing so that you can make the most of the sunlight, and the only things surrounding you are open fields and woodland, buzzards circling overhead, herds of deer grazing and pheasants and badgers wandering out of the woods. This really is a magical place where you can completely unwind and escape the stresses of day to day life. Stylish and cosy, the yurts themselves are the height of glamping luxury, with comfortable beds, handmade furniture, hot showers and beautiful redwood decking. And yet right outside your door there is birdsong, an unspoilt view and a clear sky full of stars. It’s hard to imagine a more enchanting setting. In the next village of Hinton St George (about a mile away and easily accessible by bike or on foot), you will find the award-winning Lord Poulett Arms. With flagstone floors, low beams and open fires, it ticks every box for a traditional country pub. Two miles east is Crewkerne, a market town offering supermarkets, shops, cafes and an indoor pool and gym complex. The pretty town of Lyme Regis, with its boutiques and second hand book shops, is a 30 minute drive, and West Bay & Bridport, famous for being the gateway to the Jurassic Coast, is the same distance. The beach at West Bay is stunning and Bridport itself has everything from cafes and vintage shops to an independent cinema. The coastline and countryside is waiting to be explored - walk a stretch of the coast path, go wind surfing, fishing and rock climbing in Weymouth, or visit one of the many historic houses and gardens like Montacute House, Forde Abbey, and Abbotsbury Swannery. The Yurt Retreat is located just off the A30 and A303. There are direct trains from London Waterloo, Salisbury and Exeter to Crewkerne station, which is only a 5 minute taxi ride away. It takes an hour and a half by road to Bristol and Bath and less than an hour to get to Exeter, where there is an international airport. For full driving directions please see the website. There are three 20 foot yurts on site, each of which sleeps 2-4 people. Each yurt is made in the Mongolian style, with a stunning crown of hand-sculpted wood forming the centre piece of the ceiling. The Roundhouse is at the top of the site and has uninterrupted views straight out across the fields. Newly finished it has integrated bathroom, kitchen and outdoor bath. Each accommodation is styled individually with vintage and handmade furniture, and each has a double bed and a sofa bed, as well as a wood burner in the centre which provides a warming focal point. 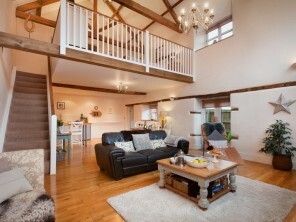 A complimentary basket of logs is provided for you when you arrive and there is a stove-top kettle for tea and coffee. Just behind your yurt is a personal bathroom with flushing toilet and sink, housed in a sweet soft cedar-clad building topped off with wooden shingles. Each yurt sits on its own private coast redwood platform, with a table and chairs for al fresco dining and sensational views over the surrounding countryside. The yurts are tucked around the edge of a woodland area, with a communal building 'The Lodge' at the heart. 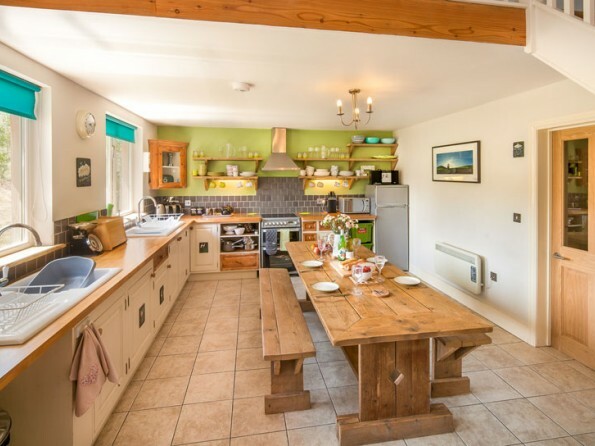 The Lodge contains a beautiful country kitchen with a large table, and you will be allocated a food cupboard and your own crockery. Communal cookware is also provided along with comprehensive cooking facilities, fridge and freezer. There is a lounge in the roof of the building with a TV and DVD player, and there is also a large book which provides useful information about places of interest and things to do in the surrounding area.